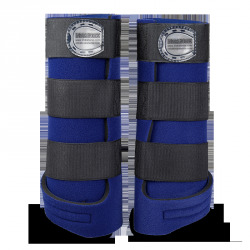 The leg protectors are elegant on the horses leg thanks to the perfect model and fit. Unique stretch Velcro closures give flexibility. You may attach these Velcro fasteners tight, as the combination of the stretch Velcro together with the other materials used, prevent any close off of tendons or veins. 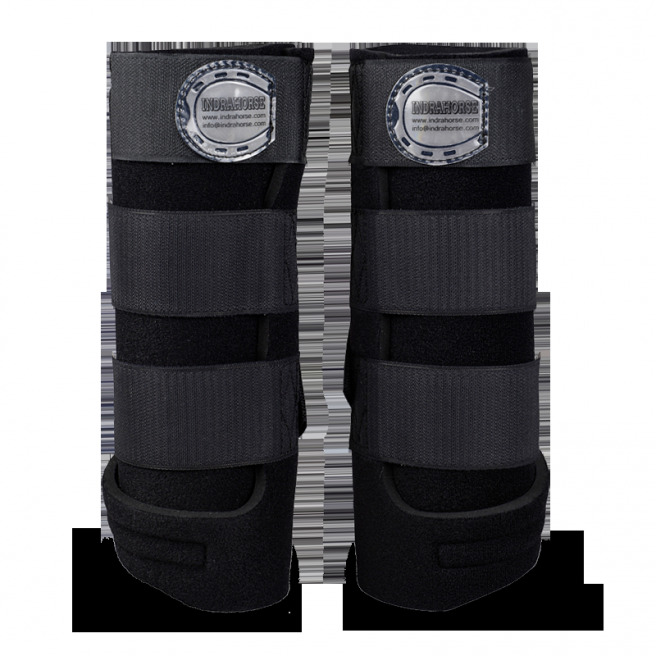 The tendons are protected by a soft, strong shock absorbing material placed so that the leg protectors remain ergonomic in use without looking bulky. When properly attached to the horses leg they will never slip down. Keep the legprotector open to the hind of the leg in the right place. Close the second and third strap. Close the stretch straps tight, especially the third one. The understrap should be attached to the lower back of the protector, not lower than the bottom of the protector. Attach the Velcro strap in the direction of the soft square and attach it there. If the strap is too long for the size of your horses leg then you cut it to size.